You are alone for the weekend in your vacation home, where a 40-foot-tall, white-fly-infested tree partially blocks your otherwise glorious view. To save the cost of calling in a professional, you’ve decided to finally get rid of it yourself. You won’t have to worry about the noise bothering anyone, since your nearest neighbors are at least a half-mile away. From some internet research, you’ve learned that you’ll need to cut off most of the branches first, then notch the base properly and set a wedge to make sure it falls in a safe area and doesn’t end up on your house. 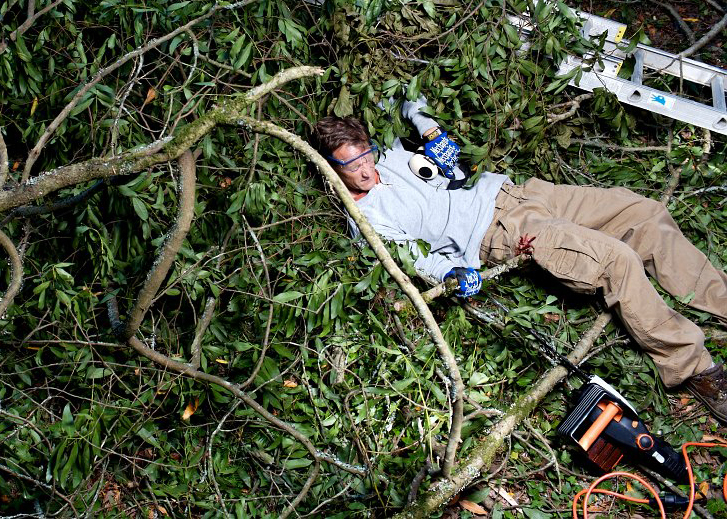 Your electric chainsaw should take care of the larger lower branches and, once they’re cleared, you can do the smaller and higher ones with your pole saw. So you get out your 20-foot extension ladder, set it securely against the trunk, and, looping the saw’s extension cord over your shoulder to keep it clear of the blade, climb up, chainsaw in hand. Your work starts smoothly, with some of the larger, lower branches breaking off under their own weight after you cut partially through them. The fallen branches pile up on the ground below. As you go higher and the branches get lighter, you have to cut deeper into them. The saw is beginning to feel heavier, and it’s time for a water break. But as you shut down the saw and start back down the ladder, you lose your balance. You instinctively drop the saw to grab for the ladder with both hands, but it’s too late. You end up taking a nasty 15-foot fall into the tangled pile of branches below, and — damn it all — right onto a 4-foot-long, 1-inch-wide stob, which, like a giant punji stick, passes straight through your thigh next to the bone! The pile of branches helped break your fall. But the branch you’ve been impaled on is locked into the other branches like a bunch of springy pick-up sticks, and together they weigh a great deal. And it doesn’t help that the bark is rough, and a few smaller branches attached to “Vlad” also have passed through your leg and now act as barbs, making extraction very difficult at best. There’s not much blood visible, but you know you need to do something for yourself fast. You’re fully dressed as any good woodsman would be. Given the distance of your neighbors, shouting would be a waste of energy. Your cellphone and the land line are both in the house, as are your Swiss Army knife, first aid kit, and the keys to your car, parked out front in the gravel driveway. The chain bar is now bent and the chain has slipped off in the fall, so even though you can reach your chainsaw, it’s a goner. The pole saw is 10 feet away, resting against a chair, with the handle in the upward position pointing away from you, and with its cutting blade resting on the ground, the way anyone interested in safety would place it. Meanwhile, this sucker in your leg is really starting to hurt … so now what? plausible and most creative solutions will each win a MAKE sweatshirt. Think positive and include your shirt size and contact information with your solution. Good luck! For readers’ solutions to previous MakeShift challenges, visit makezine.com/makeshift.